Welcome to language-easy.org! Well, as you have clicked on this article, I suppose that you are ready to enter the depth of German grammar. So, the topic of this article is the German indirect speech. Of course, most of you have heard about that topic, as it also exists in the English language. Unfortunately, the German indirect speech is slightly different to the English one. Nevertheless, you will see that this topic is not too complicated either. In the following, I’d like to structure this article in a first definition of the German indirect speech and also give some explanation and examples of its usage. After that, we will have a more detailed look on the use of the German indirect speech in different grammatical structure. Finally, we will have to talk about the subjunctive mood. Well, as in the English language, the subjunctive is also a necessary mood always connected with the German indirect speech. By the way, in case you’d like to have some background knowledge about the German indirect speech, just have a look at this article on Wikipedia. And now, let’s not lose too much time and come straight to the first point of this article, a definition and the correct usage of the German indirect speech. Los geht’s! Well, first of all we should clear up what the German indirect speech actually is. So, keep in mind the following short definition of the German indirect speech. The German indirect speech allows to report what someone has said without repeating their exact words. 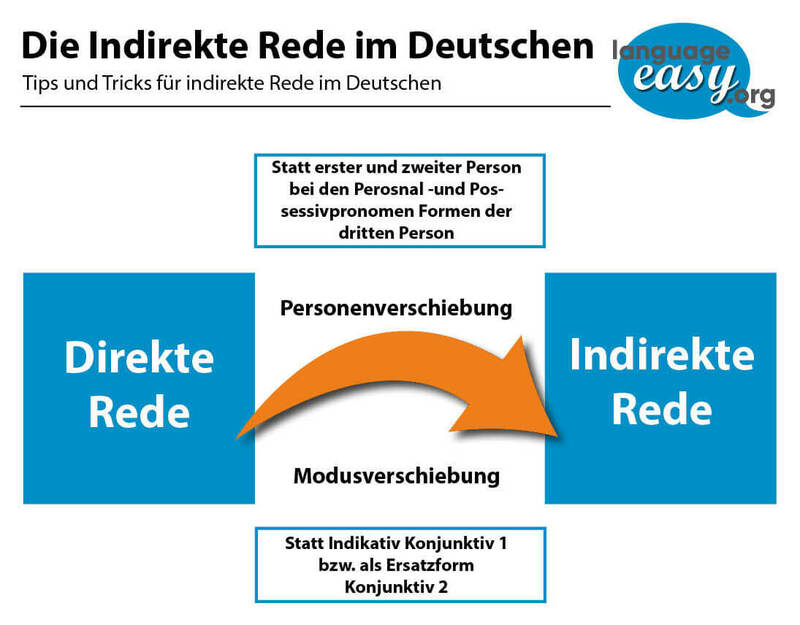 Sometimes, the German indirect speech is also called reported speech and in German “indirekte Rede”. So, The German indirect speech can be found in newspapers or every media, where something is reported and reproduced what a third person has said. Now, let’s come to the next point of this article – the conversion of direct speech into German indirect speech. Well, in case you want to convert the direct into German indirect speech, you should consider three important factors. So, in the following, I’d like to list them. So, as we have cleared up the conversion of direct into German indirect speech, let’s come to some grammatical structure where the German indirect speech is of high importance. So, in the following, I’d like to talk shortly about three other grammatical structures, where the German indirect speech is of high importance. As a first grammatical structure where the German indirect speech can be found, we can name the declarative sentences. you easily convert this kind of sentence into German indirect speech just by adding “dass” to the introductory clause. So, question sentences also include the German indirect speech. Well, you can simply introduce it by using the question word. Finally, we have to mention the the demands and requests where usually modal verb “sollen” is used. In case you’d like to sound more polite, just use the verb “mögen”. Finally, we have reached the last topic of this article about indirect speech. Well, in order to use the indirect speech, we can use the indicative or the subjunctive mood. So, whether to use one of these moods, depends on the context: Whereas the the indicative is mostly used in spoken language, German use the subjunctive mainly in written language. So, if we use the indicative, we can assume that we believe and/or agree with the original speaker. If we use the subjunctive, it’s clear that we are simply repeating what the original speaker said (whether we believe him/her or not). In this way, the subjunctive is a neutral form. So, that’s why indirect speech in radio reports and newspaper articles is always presented in the subjunctive. Now, we come to an essential topic in this article about the German indirect speech. Here, I’d like to give you a short overview about the correct usage of the different tenses in the indirect speech. Well, you will see that we actually use the subjunctive 1 forms, unless these form are identical to the indicative. Present “Ich spreche.” Er sagt, er spreche. Present Perfect “Ich habe gesprochen.” Er sagt, er habe gesporchen. Simple Past “Ich sprach.” Er sagt, er sprach. Past Perfect “Ich hatte gesprochen.” Er sagt, er hatte gesagt. Future 1 “Ich werde sprechen.” Er sagt, er werde sorechen. Future 2 “Ich werde gesprochen haben.” Er sagt, er werde gesprochen haben. Please, try to keep this table in mind as a useful guide for the correct usage of tenses in German indirect speech.